Spring and summer bring carefree lazy days relaxing by the pool, barbecues with friends…and unfortunately, house flies and fruit flies. Yes, when summer arrives, often so does the fly. House flies and fruit flies can all put a damper on outdoor and indoor fun, so fly control is important. Found throughout New Zealand, house flies are the most common flies in homes. The dark grey house fly can grow to 1/4" in length and usually lives only 15 to 25 days. Although house flies usually do not travel past one to two miles from where they are born, house flies will occasionally travel up to 30 kilometres to find food. House flies have taste buds on their feet, which are 10 million times more sensitive to sugar than taste buds on the human tongue. House flies can carry over 100 different kinds of germs, most of which can cause disease, so it’s important to control house flies. To deter house flies from entering or remaining in your home, keep it clean. Remove waste regularly, use sealed rubbish receptacles, and clean up pet waste immediately. You can also practice good house fly prevention by installing fine mesh screens on doors and windows. 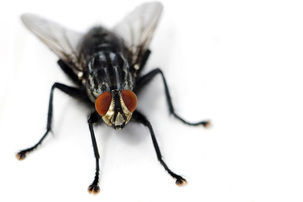 Flight: Yes House flies get their name from being the most common fly found around homes. Adult house flies can grow to 5-6 mm and usually live between 15 and 25 days. Although they’re genetically close to humans, fruit fries don’t exactly look like people! Fruit flies prefer to feed on decaying fruits and vegetables, and are frequently found in places where food is processed, such as restaurants and homes. Fruit flies particularly like moist decaying fruit or other food that has been sitting in one spot for several days. Because they are frequently found in unsanitary conditions, fruit flies are a potential health concern, especially when they show up in hospitals or other health facilities, so controlling fruit flies is important. For efficient fruit fly prevention, keep food areas clean. Remove rubbish regularly (at least daily) and scrub counters and other surfaces in your home.